When a couple is in the throes of celebrating an engagement and planning a wedding, thoughts about the possibility of divorce are the farthest thing from their minds. Consequently, many couples skip the talk about the benefits of a prenuptial agreement, and assume that everything will work out. Sidestepping this issue when young is easier to understand because the parties are less likely to have valuable assets, but when marrying at an older age, and especially in instances of second (or subsequent) marriages, prenuptial agreements are important to safeguarding assets that have been built over a lifetime. A former Clerk of Courts for Broward County is learning this lesson the hard way as he battles his second wife in a divorce case over a share of his deferred income from the state’s retirement program and Social Security benefits. It may seem pessimistic to dwell on the potential for divorce, but for those with a lot at stake financially, having this document in place is a smart way to protect these assets from being substantially depleted in divorce. This is an important consideration if there are children from a previous marriage to whom a parent intends to leave an inheritance. A discussion of what a prenuptial agreement is, what it can and cannot do, as well as the benefits a prenuptial agreement can bring to a marriage, will follow below. 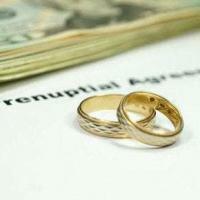 What Is a Prenuptial Agreement, Anyway? A prenuptial agreement, also referred to as a premarital or antenuptial agreement, is a contract a couple enters into before marriage that governs the division of assets and payment of spousal support, or alimony, in the event of divorce or other specified occurrence (death, incapacity, birth of children, etc.). Without such an agreement, a spouse is typically entitled to 50 percent of the marital assets if the couple later divorces. Though having a prenuptial agreement does not negate the possibility of litigation, having a well-crafted contract from an experienced family law attorney will make it less likely a court will invalidate the agreement. Prenuptial agreements are intended to protect assets from division in divorce, protect against assuming the liabilities of the other spouse, and protect the other spouse from claiming certain future earnings. However, Florida law specifically prohibits the enforcement of clauses in prenuptial agreements that attempt to release a party from a child support obligation, or would leave one party destitute and forced to seek public assistance for means of basic support. One way to make the discussion of a prenuptial agreement less negative is by using it as an opportunity to learn about each individual’s approach to finances. Finances are one of the leading causes of divorce, and working out how to handle these matters before marriage reduces the chance of disagreement. Further, a valid prenuptial agreement requires both parties to fully disclose all income, assets and liabilities so each person knows exactly what they are gaining or losing under the agreed upon terms. Further, knowing this information up front will give a couple the opportunity to blend their financial styles into an approach that is workable when finances do become shared. Prenuptial agreements must follow certain rules to be enforceable, and involve complex issues that have long-term consequences. To ensure the executed agreement reflects what you want, work with a family law attorney that understands how courts view these contracts. The Tampa Bay law firm All Family Law Group, P.A. understands how important these agreements are, and is available to provide you with a free consultation to discuss your concerns. Contact the Tampa divorce attorneys and family lawyers at All Family Law Group, P.A. in Tampa Bay at 813-816-2232 for a consultation at no charge or email us.